Since its beginning in 1974 as a small group of specialists in a previously unknown discipline, ACM SIGGRAPH has evolved to become an international community of researchers, artists, developers, filmmakers, scientists, and business professionals who share an interest in computer graphics and interactive techniques. Annual SIGGRAPH and SIGGRAPH Asia conferences, two of the premier technology conferences in the world. An international network of Student and Professional Chapters, which host year-round activities highlighting computer graphics and interactive techniques. A robust Education Program that supports both computer graphics education and the use of computer graphics in education with curriculum studies, a web site for educators, and other educational projects. An international Digital Arts Collaborative that fosters the evolution of a strong digital arts community and promotes dialogue among visual artists, scientists, interaction designers, and more. Focused symposia, conferences and workshops on topics related to computer graphics and interactive techniques. Prestigious publications and conference proceedings in the Digital Library that provide the largest source of citations in the computer graphics literature. SIGGRAPH Video Review, which documents the annual SIGGRAPH Computer Animation Festival, providing an unequalled opportunity to study state-of-the-art computer graphics techniques, theory, and applications. An awards program that recognizes achievements in the profession and service to the community. A strong volunteer program that allows members to become involved in the community and network with luminaries in the profession. ACM SIGGRAPH's mission is to foster and celebrate innovation in Computer Graphics and Interactive Techniques. The organization promotes its vision by bringing people together in physical, on-line, and asynchronous communities to invent, inspire, and redefine the many creative and technical artifacts, disciplines, and industries that are touched by computer graphics and interactive techniques. 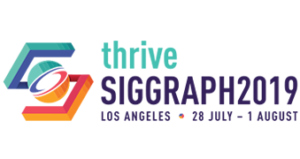 ACM SIGGRAPH strives to be the premiere community and catalyst for the creation, promotion and dissemination of information on computer graphics and interactive techniques. Our purpose is to foster a membership community of people whose core values help them to catalyze the innovation and application of computer graphics and interactive techniques. We value excellence in the information and experience provided by our products and activities. We value personal and organizational integrity in the selection of our content and in our interpersonal and organizational relationships. We value the passion our community feels for ACM SIGGRAPH and for the field of computer graphics and interactive techniques. We value volunteers and volunteerism in an environment that actively supports its volunteers. We value the interaction among the many disciplines that make up our community. The ACM SIGGRAPH community depends on your support. In recognition of their support, ACM SIGGRAPH members receive the monthly e-newsletter Interactions, discounted registrations for the annual conferences and all other ACM SIGGRAPH-sponsored events, and access to the archive of SIGGRAPH Conference Proceedings in the ACM Digital Library.